Star Plus�s soon to be launched programme, Aap Ki Kachehri Kiran Ke Saath, is about real people, real disputes, real drama and real emotions. A first of its kind on Indian television, the show offers open hearings of civil disputes and a compassionate yet firm and lawful mediation and arbitration by Dr. Kiran Bedi. This journey from the despair of dispute to hopeful resolution is laden with the promise of fascinating insights into human behaviour and values of our society today, along with promoting a better understanding of our rights and laws. Each episode will see disputants bringing forth their conflicts, stating and arguing their complaints and demands themselves. As the human stories unfold, common predicaments and real dilemmas will be laid bare. From calm reasoning, heated arguments to raw emotional outbursts - helplessness, anger, despair, and often, relief � Aap Ki Kachehri Kiran Ke Saath encapsulates a variety of human behaviour and emotions. At the helm of the show as mediator/ arbitrator is India's first woman police officer and Magsaysay Award winner, Kiran Bedi. An icon who is known to be fair, frank and fearless. While dealing with the disputes, she is the questioner, counselor, mediator and arbiter, all rolled into one. Her dealings though compassionate, rest on firm foundations of the law, rights and social equity. Whether it is a combination of real life drama and emotion and / or legal awareness, there is something refreshing in the show for every viewer. Above all, Aap Ki Kachehri Kiran Ke Saath is a ray of hope in the lives of millions of people struggling to be heard. Kiran Bedi is a judge in the show. Every episode new disputes come which are solved by Kiran Bedi. Aap Ki Kachehri Kiran Ke Saath, is about real people, real disputes, real drama and real emotions. A first of its kind on Indian television, the show offers open hearings of civil disputes and a compassionate yet firm and lawful mediation and arbitration by Dr. Kiran Bedi. This journey from the despair of dispute to hopeful resolution is laden with the promise of fascinating insights into human behaviour and values of our society today, along with promoting a better understanding of our rights and laws. Each episode will see disputants bringing forth their conflicts, stating and arguing their complaints and demands themselves. As the human stories unfold, common predicaments and real dilemmas will be laid bare. From calm reasoning, heated arguments to raw emotional outbursts - helplessness, anger, despair, and often, relief � Aap Ki Kachehri Kiran Ke Saath encapsulates a variety of human behaviour and emotions. 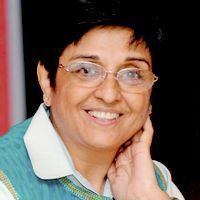 At the helm of the show as mediator/ arbitrator is India's first woman police officer and Magsaysay Award winner, Kiran Bedi. An icon who is known to be fair, frank and fearless. While dealing with the disputes, she is the questioner, counselor, mediator and arbiter, all rolled into one. Her dealings though compassionate, rest on firm foundations of the law, rights and social equity. Whether it is a combination of real life drama and emotion and / or legal awareness, there is something refreshing in the show for every viewer. Above all, Aap Ki Kachehri Kiran Ke Saath is a ray of hope in the lives of millions of people struggling to be heard.